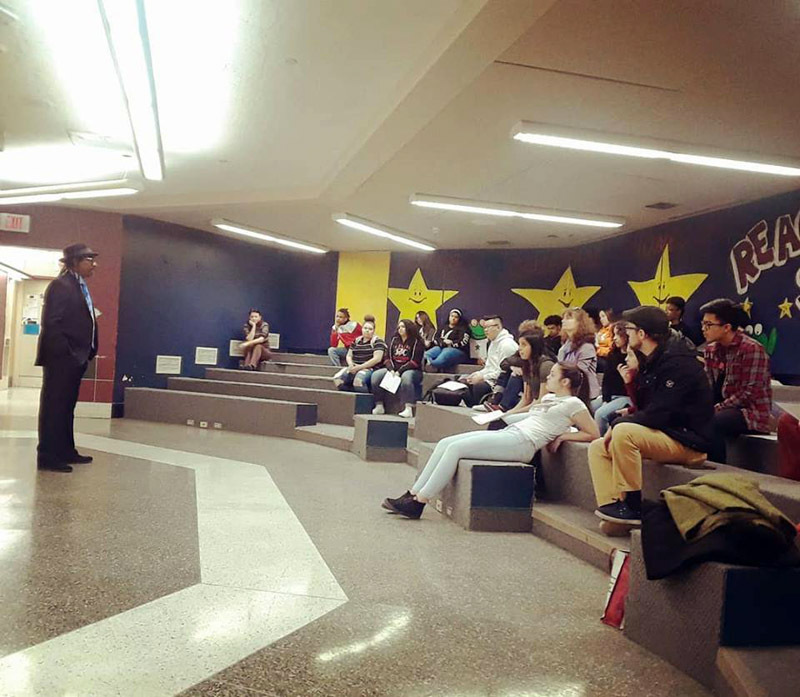 On a snowy Tuesday in February, high school students at Claremont Academy listened with interest as Mr. Robert T. Jones spoke about his migration from tough Bronx kid to teacher of Kingian nonviolence. The Associate Director of Multicultural Education at the College of the Holy Cross, Mr. Jones was trained in Dr. Martin Luther King’s methods of nonviolence by noted civil rights leader Dr. Bernard Lafayette. From 2008-2011, he worked with Dr. Lafayette teaching these methods to freedom fighters in the Niger Delta region of Nigeria. Among those attending Mr. Jones’ presentation were students from Ms. Karen Henderson’s US history class. She reports they loved the talk. Nonviolence is a way of life for courageous people. It is a positive force confronting the forces of injustice and utilizes the righteous indignation and the spiritual, emotional, and intellectual capabilities of people as the vital force for change and reconciliation. The Beloved Community is the Goal. The nonviolent concept is an overall effort to achieve a reconciled world by raising the level of relationships among people to a height where justice prevails and persons attain their full human potential. Attack forces of evil, not the persons doing evil. The nonviolent approach helps one analyze the fundamental conditions, policies, and practices of the conflict rather than reacting to one’s opponent or their personalities. Accept suffering without retaliation for the sake of the cause to achieve a goal. Self-chosen suffering or sacrifice is redemptive and helps the movement grow in a spiritual as well as humanitarian dimension. The moral authority of voluntary suffering for a goal communicates the concern to one’s own friends and community as well as to the opponent. Avoid internal violence of the spirit as well as external physical violence. The nonviolent attitude permeates all aspects of the individual, providing a mirror reflection of the reality of the condition. Actions must be guided by a high level of spirit and morality that avoids all forms and feelings of inner violence. The Universe is on the side of justice. Truth and justice are universal and human society and each human being is oriented to the just sense of order of the universe. The fundamental values in all of the world’s great religions include the concept that the moral arc of the universe bends toward justice.